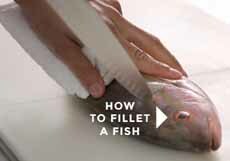 It’s easy to learn how to cut and slice the correct, efficient, safe way. You’ll feel good about it, too (photos courtesy Wüsthof). Most of us have never taken a knife skills course. Most likely, we learned from watching food prepared at home or on TV, or simply by freestyling. After all, we’re intelligent; we can figure it out. Right? Unless you can do the following to your satisfaction, you’ll benefit by investing a few minutes on the Wüsthof website. How to cut consistent slices and dices. Different thicknesses don’t cook evenly, and the finished product doesn’t look as good. How to chop garlic, herbs and onions into very small, consistent pieces. 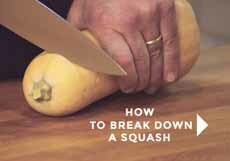 How to slice different types of vegetables, including the formidable winter squash group. How to work faster and safer. Practice makes perfect—and speedy. 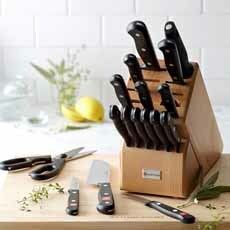 The basics: The 3 essential knives: chef’s, paring and serrated knives and how to use them. How to sharpen serrated blades. 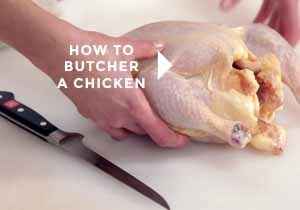 Learn how to break down whole chicken or filet a whole fish, and you’ll enjoy big savings, too. Dice an onion into uniform pieces. Each is succinct, enabling you to play it as many times as you need without wasting time. So grab your phone or tablet, head to the kitchen, pull out a cutting board and start cutting—the right way.